President Donald Trump‘s campaign announced Wednesday morning that he will hold a rally Feb. 11 in El Paso, just hours after the president’s State of the Union speech where he reiterated a repeatedly debunked claim that El Paso was one of the country’s most dangerous cities until the Secure Fence Act of 2006 was passed and several miles of barrier were built in the border city. Trump repeatedly railed against the border city Tuesday evening, saying El Paso and San Diego were dens of violent crime until a fence was built in those communities. His comments drew ire from several prominent Democrats who quickly jumped to the city’s defense. 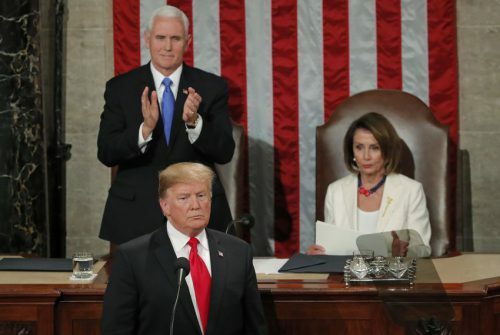 A fact check of the president’s speech published by the El Paso Times Tuesday noted that violent crime in the border city actually peaked in 1993, then fell by more than 30 percent between that year and 2006. Construction of the barrier in El Paso didn’t begin until 2008, the Times reported. El Paso’s crime rate has continued to drop in the years since, from 457 crimes for every 100,000 residents in 2009 to 393 in 2014, according to FBI statistics. El Paso is the home of Beto O’Rourke, the former Democratic congressman and U.S. Senate nominee who is now considering a presidential run. On Tuesday, O’Rourke said he will make a decision by the end of the month. This entry was posted in KRTS News and tagged Border, El Paso, President Trump. Bookmark the permalink.